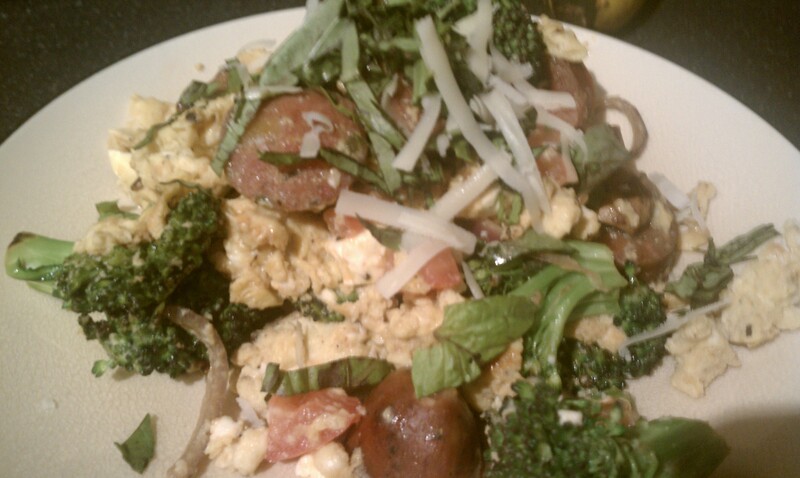 it never takes me long to get back to cooking eggs, especially for breakfast. 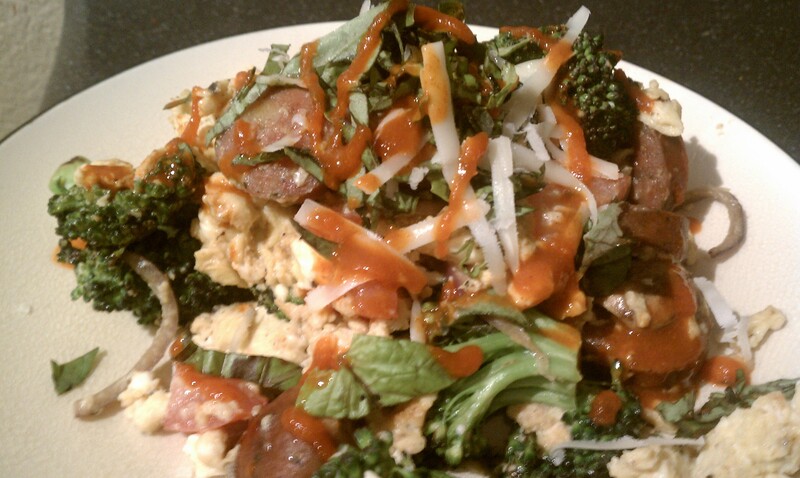 since i hadn’t been the grocery store in awhile this is more of a “whatever is in the fridge type scramble,” however, i thought it turned out quite delicious and wanted to share. start by cutting sausages into 1/2 inch wide circles and brown in pan over medium heat. once browned, remove sausage rounds from pan and set aside. next, add mushrooms and onions in same pan and cook over medium heat with the sausage grease for about 10 minutes. don’t move around on pan much, you want them to brown on each side as well. add salt and pepper to taste. in separate pan, brown the broccoli with 1 tbsp butter over medium heat about 5 minutes on each side. it is important to let broccoli cook without moving so each side can get cooked a bit. whisk eggs together with the salt, paprika, pepper, feta cheese, and dried basil. pour egg mixture into buttered saute pan and cook over medium heat. stir eggs occasionally(scrambling) for 3-5 minutes. 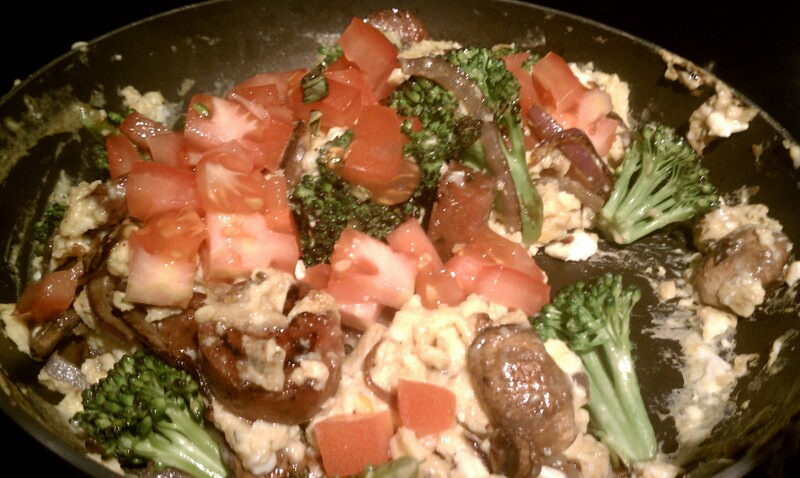 once eggs start to form shape, stir in the sausage and cooked veggies. cook for 1-2 minutes stirring everything together. finally, throw in the diced tomatoes and cook for one more minute. to finish it off, garnish with chopped basil, sriracha sauce, and freshly grated parmesan cheese. I’m hungry!!!! :0 I love egg dishes. Will have to try this one.